All data captured follows strict GDPR compliance with 'Opt-In' fields. The app has been designed to work on all iOS devices even older iPhones and iPads. No WiFi? No problem. The app works offline and securely stores your sales leads until internet connection is established. Easy to customise and add your own logo. Set-up capture fields with unlimited survey questions and various question types. With every successful capture, you have the option to send a custom and personalised 'Thank you' email. Easy to brand with your logos, colours and background images. The app helps set the right first impression to your valuable sales leads. All leads are stored encrypted on the device. When connected to the internet, these are securely sent to your Dashboard. Through your Dashboard, you can create unlimited events, each with their own capture fields, and email bounceback. Connect directly to one of our support team via your Dashboard if you have any query with leadr. Agents/Sales personnel can be added to help capture more sales leads at any event. Easy to add data capture cards, which can be dynamically adjusted and helps the capture process follow a natural conversation. Pay as you use Tokens are priced for as little as £29.99 ex TAX. Each Token allows you to securely export 100 sales leads. Easy to customise. Set-up capture fields with unlimited survey questions and various question types. 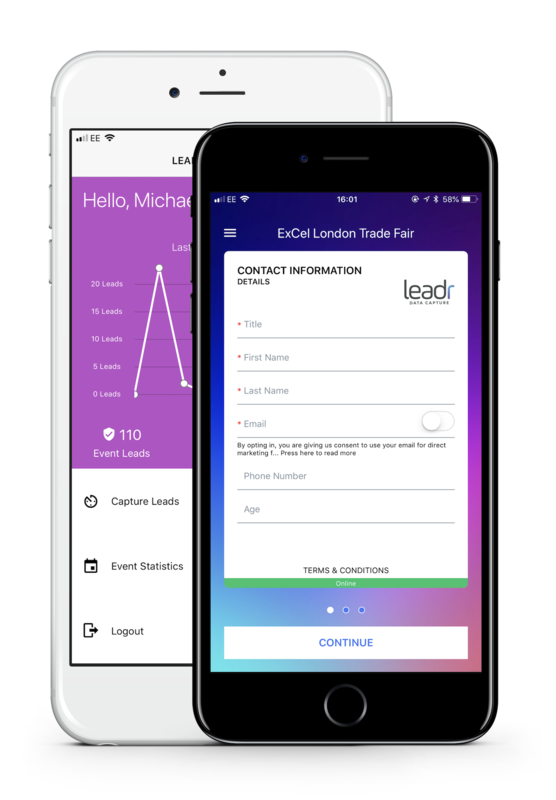 The leadr Dashboard enables a wide array of tailoring and adjustments to help make your events generate more sales leads. Capture your sales leads with multiple iOS devices by creating agents. They are all linked to one online Dashboard and one LEADR Data Capture account. Perfect for sales teams at exhibitions. We understand that at exhibitions, Wi-Fi connectivity is a known and frustrating issue. LEADR Data Capture works offline, without a Wi-Fi or mobile connection. Capture sales leads wherever you are. Through your Dashboard you can analyse events, track agent performance and identify your most effective campaign, all in real time. Our 'Pay as you use' Tokens enables you to only have to pay for what you have captured. No minimum contracts and no monthly charges. Each leadr Data Capture Token provides you with 100 sales leads to be securely exported. Tokens never expire so can be used for multiple events/exhibitions. Our application is on the App Store available for iPhone and iPad devices. 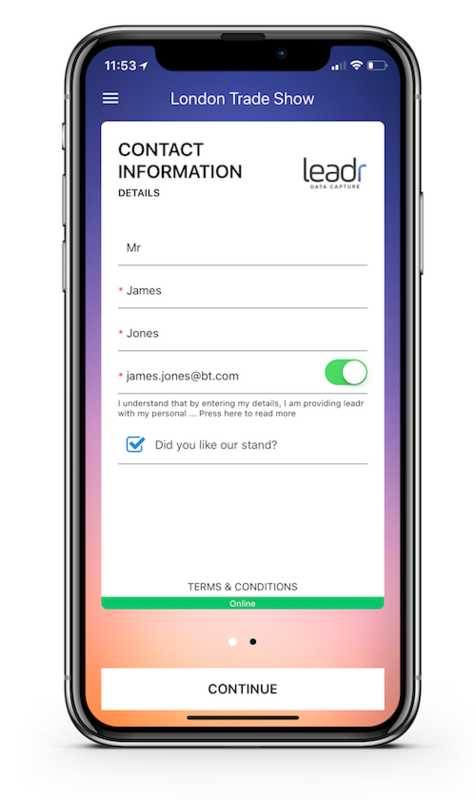 leadr is a trading style of MediaBase Direct Limited a company which is registered in England and Wales (registered company number 2651463) with its registered office at TML House, The Anchorage, Gosport, Hampshire, PO12 1LY.